So the About portal really was just a redesign for the most part. The process was the usual inventory of pages of the current About section (see below left), trying to put them into cateogries, then coming up with a preliminary information architecture. 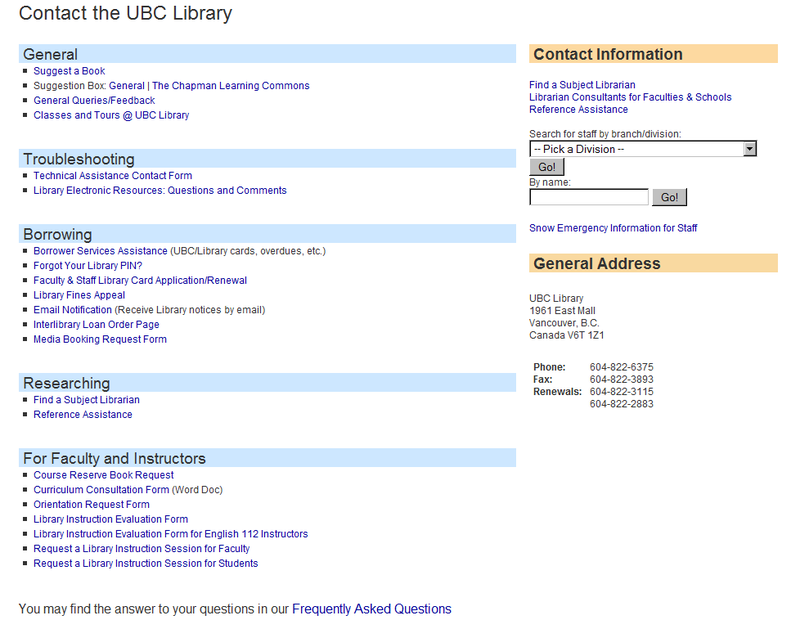 For this portal, we also consulted with the Communications department to ask about what else might be added. 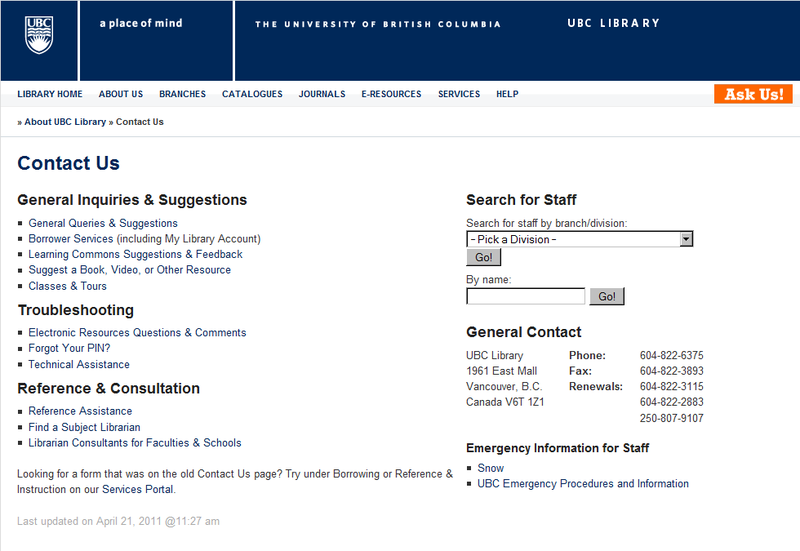 The first attempt at the redesign was to use the existing design from the Help and Services portals (see above right). If you look at the full version, you can tell that the problem with using the existing design is that there is a lot of white space since each category only has 2-4 links. Everyone, who looked at this first attempt, agreed that it just didn’t work. We concluded though that since the About portal didn’t serve the same sort of purpose as Help, Services, and Find, it would be okay to use a different design. So, it was back to the drawing board. When thinking about how we might do another design, one of the ideas was to somehow bring the University Librarian’s message back to the foreground. We essentially ended up with the layout of the old design, just with the set of links organized in the new way. This didn’t work either since the navigation of the portal was essentially lost. Finally, I thought perhaps we could go with a simpler design. 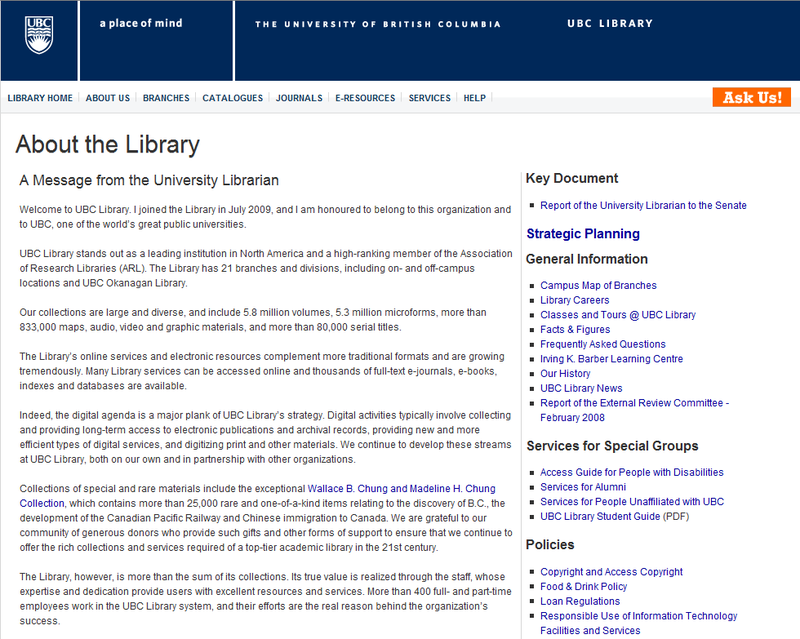 I looked at a bunch of other sites (library and otherwise) to see how they dealt with the layout and organization of their About sections. Based on those layouts and suggestions from others, we came up with the current design. The new About design uses the same organization as in the first version, but simply lays out all the links underneath a heading. 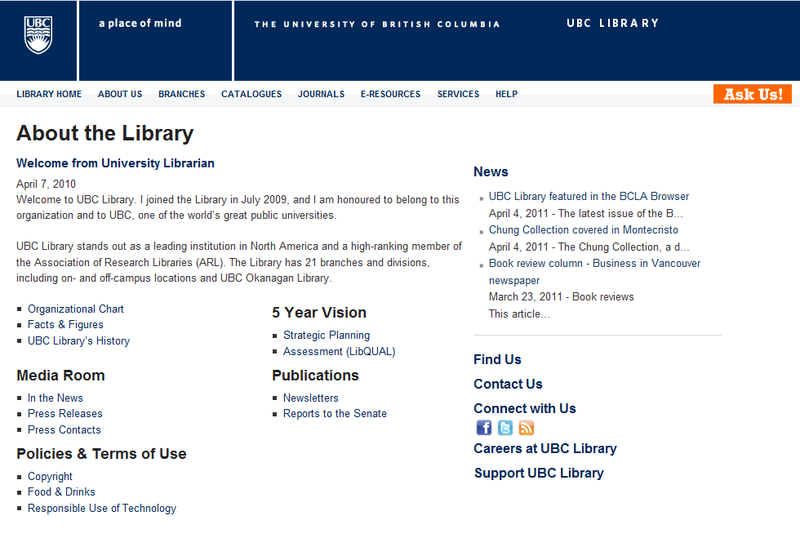 It also has the first two paragraphs of the university librarian’s message, where if you click on the title, you will see the full message. We agreed that this was a nice balance between the first and second attempts. 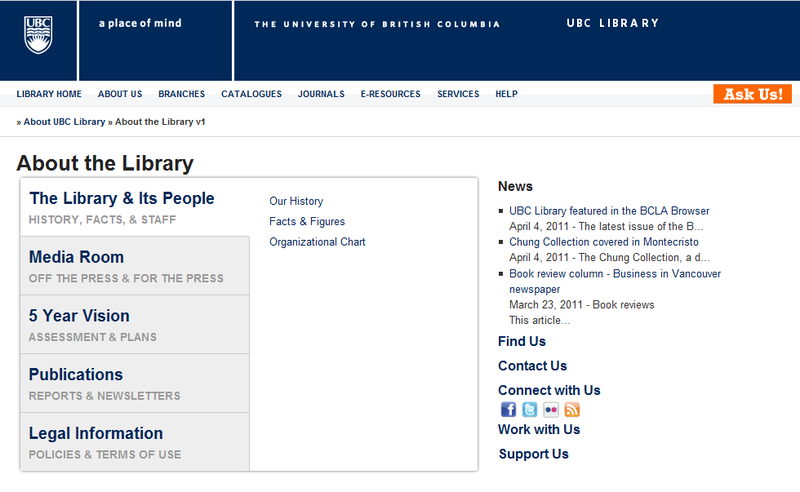 Most pages/posts were simply moved over, but all were in agreement that the Contact Us page needed a redesign. So, a redesign it was. We felt that the old page had too many links (all users who saw this page during the usability test said as much), especially since a lot of these links exist elsewhere on the site (namely on the Services Portal) and the front page as well in many cases. A couple of the forms were merged or updated to par down the number of links further. Migration of all the pages have been done and everything has been setup, but since the Newsletters were moved into Issuu, issues were embedded to posts (which worked fine), but then didn’t show up on aggregated pages (the embedded object would just be stripped out). Styling has yet to be done as well. Hopefully it’ll be live soon though. Next Next post: Personal Computers on Services live!